Extremely insulating and lightweight rev..
Harkila Hurricane Jacket has been clev.. 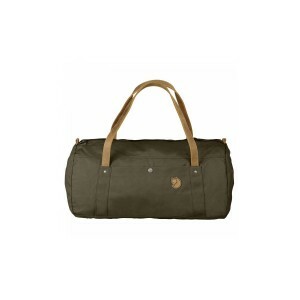 Extremely lightweight 3-layer soft she..
Lightweight hunting jacket with waterpro..
Fjällräven's first duffel bag, Sailor Bag 214, was released in 1973 and Duffel No. 4 has been developed in the same spirit with versatile functions and a classic, clean design. A 40 litre version of the bag holds everything you need for a short trip. A large zippered main opening with an easy-to-grip pull makes it easy to pack and unpack, and an inner safety pocket holds small items. Two outer pockets, one zippered and one with a push button, and double layers of fabric on the bottom for reinforcement. The straps are designed so they can be carried in the hand, on the shoulder or across the back. The strong, waxed G-1000 HD fabric and leather straps mean that this bag will stay with you for years and become more attractive the older it gets. Made from robust G-1000 HeavyDuty Eco. Environmental info: Biological|Fluorocarbon-free impregnation|RecycledFjällräven's first duffel bag, Sailor Bag 214, was released in 1973 and Duffel No. 4 has been developed in the same spirit with versatile functions and a classic, clean design. A 40 litre version of the bag holds everything you need for a short trip. A large zippered main opening with an easy-to-grip pull makes it easy to pack and unpack, and an inner safety pocket holds small items. Two outer pockets, one zippered and one with a push button, and double layers of fabric on the bottom for reinforcement. The straps are designed so they can be carried in the hand, on the shoulder or across the back. The strong, waxed G-1000 HD fabric and leather straps mean that this bag will stay with you for years and become more attractive the older it gets.